Just thought I'd pass my two cents. I presently am using a Digital Audio G4. Bought it off of eBay for $77 + $29 shipping. I bought it so that 1). I would not have to deal with laptops overheating in Leopard, 2). I would not have to deal with driver upgrades required to use a bootable image between my iBook G4/1.2 GHz and my other system (a G5 has additional stuff in the bootfile that is not required in the G3/G4). Originally I was using a PB G4/1.5 GHz, but upgrading to Leopard brought the system to burnout and presently is overheating my iBook. As a technician for Macs in my area, I no longer recommend Leopard for G4 laptops of any sort. They heat up too much, especially visible when doing things like Repairing Permissions. Hence, because I wanted to stay with G4s, the DA; it has a fairly modern databus, no Southbridge to slow the PCI bus, and exhibited fairly good performance in virtually every facet of the system. I considered a MDD, but the initial purchase price might have precluded other upgrades needed to optimize performance - and to beat what I have now, I would need Power Mac G5/DP 1.8 GHz minimum. These continue to be quite expensive. The present DA has been upgraded with everything. Dual-core 1.6 GHz processor card; 1.5 GB RAM; 2 250 GB Barracuda drives (16 -meg caches) feeding into a Acard RAID card (getting 105 MB/sec average); ATI 9800 Pro video card, and a 4-port USB 2.0 card. In other words, pretty much everything. Now for the bad news, Xbench video performance in Leopard (130) is less than half what it is in Tiger (350). Even though I'm filling memory in Xbench at 1700 MB/sec, and Geekbench reports 1200 points in both Tiger and Panther systems; video performance suffers drastically in Leopard. This does not mean there is anything inoperative in using video in Leopard. But the maximum video performance is Leopard is measurably less, and it's drastic. Thought you'd like to know <grin>! Thanks for writing. I'm quite content with my dual 1 GHz MDD Power Mac G4 and its stock Radeon 9000 video card. I've booted Leopard on it once just to try it, and performance seemed okay. However, since this is my production machine and production requires Classic, I spend almost all of my time in Tiger. Every benchmark program has strengths and weaknesses. Geekbench looks only at CPU and memory performance. Xbench uses its own system to weight the results of video tests. The big question is how it feels to you, and if it feels sluggish, does that mean going back to Tiger or picking up an even better video card? I'm not in a position to make that determination yet, but I do have Leopard on an external FireWire hard drive, so I can test it on my MDD Power Mac and 1.25 GHz eMac. More on that when I've had a chance to really work with it. I just wanted to thank you for hosting such a wonderful site. I've been an owner of a iMac G3 SE 600 for, well, I guess it has been 7 years now. It was originally purchased to accompany my band, but due to my short lived punk rock career (ending at 19 y/o), I updated the OS to Jaguar and began using it mainly as a storehouse for MP3s and photo-editing of my paintings. It has always been my only computer, and I love it and would never get rid of it. But it was not until now that I realized that all those people that said upgrading an iMac was a pain and nearly impossible have, obviously, not tried. It all changed when I stumbled upon your site. It was definitely fate, as I was actually pricing a "better" computer to learn animation on. I ended up spending enough on this computer to finance 3 more iMacs, but as I said, I love this thing and I'm going to squeeze every bit of life from it. That said . . . here's what I ended up with thanks to your site. I understand. I paid $200 a long, long time ago to have a 16 MHz upgrade put in my Mac Plus, and for the first time it didn't feel sluggish with System 7. My second Mac was a Centris 610 purchased with just 4 MB of RAM; bumping that to 8 MB (and later 12) made a world of difference. My third was a Umax SuperMac J700, which started its life with a 180 MHz 604 CPU and ended up somewhere around the 300 MHz G3 mark - along with a better video card and more RAM. My titanium PowerBook G4/400 really benefited from a faster hard drive and more RAM as well, as did my eMacs and my current Mirror Drive Door Power Mac. I'd love to get my hands on a fast G3 iMac some day - I've only got 400 MHz and 450 MHz ones, and the later models have much better graphics processors. It's a shame that only the 500 MHz and slower iMacs can take G4 upgrades. Like many others, I resorted to using VLC for viewing YouTube videos after reading LEM's series of articles and mailbag posts on slow Flash performance on G3 Macs. I have been using Adobe Flash 8 and then 9, and I was getting awful results for streaming video. I don't normally advocate using beta software as a fix for a problem, but Adobe recently released a new beta version of Flash Player 10. I downloaded it this morning and installed it, and watched the HappySlip video "Mac Beautiful" under Camino, with TextEdit and Entourage running in the background. The video (and subsequent ones I've used) was definitely watchable and better than previous versions of the Player I've tried. I was able to bounce around the video clip while it was still loading. The player took a second or so to find its place, reconnect to the server, and start streaming again - but no beachball yet. YMMV, of course, depending on amount of available RAM and network latency, but you might want to try it out on one of your non-production Macs and see if it fixes more than it breaks. Overall it seems to be doing a better job on my G3/900 iBook - of course, I have no high-end Mac to try it out on to see what it can really do. I just happen to keep a 400 MHz ruby red iMac on the desk next to me. I've downloaded the Uninstall Flash Player OSX program, which requires you to quit all browsers before it will do it's thing. Once that was done, I ran the Flash Player 10 Beta installer. It's nice not having to reboot, but when I tried to view "Mac Beautiful" in Safari, it said the Flash plugin wasn't installed. Now there's something frustrating: Adobe's uninstaller seems to remove Flash from every partition on every attached drive. That's just not right, but the uninstaller didn't show any options to remove Flash from just the current boot drive. And it takes a l-o-n-g t-i-m-e with all these partitions. Poor form, Adobe! The unistaller should only look at the current boot drive unless the user specifies otherwise. Okay, back to Panther. Run the uninstaller, restart the computer, and then run the Flash Player 10 installer. Another dead end. Back to the uninstaller and Flash Player 9 on this iMac. Well, I certainly didn't intend to cause all of that trouble for you. The Flash Player uninstaller worked flawlessly for me on the first try under Tiger 10.4.11, as did the v10 installer. I don't have multiple partitions or OSs installed on iBook, so I didn't experience the issue with multiple installs being removed. I do notice that Safari is noticeably slower than Camino, which is my browser of choice. I don't use either iCab or Firefox on this machine, so I can't testify to whether they run better, worse, or the same. IE 5.2 won't even load the YouTube website half the time; it chokes while trying to load a JPG file. I suspect my installation is corrupt, and I'm in no particular rush to fix that. I would definitely agree that the Installer needs some work, though, if only because they force you to download a nearly 40 MB disk image, 30+ of which is unused space. When the Windows version is an 800 KB file, that is inexcusable. I've already sent an email to Adobe about that. I'm sorry Flash 10 didn't work for you. I'm going to continue to stress-test it and see what the final release looks like. FWIW, Adobe seems to be increasing the amount of graphics processing being off-loaded to the video chip, which means it is even more important to consider a Mac with discrete graphics, new or pre-admired. I've been a huge fan of Camino for years. It used to be my default browser, and my wife uses it on her computer as well. Lately I've been using Firefox 3 beta and Safari 3.1 just to see how nicely they work. They're all fast. Trying to install Flash Reader 10 was a learning experience, even if it didn't work. Thanks for the tip. I can't believe I didn't notice this before - the aluminum keyboard that came with this iMac has a "fn" key in place of the "help" key on the bloc above the arrow keys on the previous white Apple keyboard. It works flawlessly, even when I'm logged into a XP machine through Microsoft Remote Desktop. Well I'll be. Come to think of it, I don't think I've ever used the Insert key on a Mac keyboard, which is what the "fn" key replaces. Kudos to Apple! 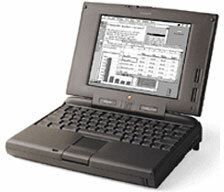 I have a nice PowerBook 5300ce that I just upgraded with a 4 GB Compact Flash flash card with the Addonics adapter. I have been trying to get it on my WiFi network at home with the Orinoco Gold WiFi card and the Orinoco software plus driver. I have successfully connected with it where my AirPort Extreme base station was stripped of any WiFi security. When I enable the lowest level encryption (using Leopard), it is set to WEP Transitional Security (128-bit). That means a 13-digit ASCII passcode is required. Over on the PowerBook side, running Mac OS 8.6, I cannot connect. It does allow me to input a passcode for WEP encryption. I have inputted the 13-digit code, but it is not getting a proper IP/Subnet mask. I even went into the TCP/IP control panel to make the respective WiFi configuration active. It will not connect, however. I did speak to the Orinoco people . . . they hypothesized that I needed to use a hexadecimal passcode (26 digits) vice the ASCII passcode (13 digits), because the Orinoco software does not play nice with the ASCII passcodes at 128-bit encryption over WEP. You can get a hex passcode from Leopard's AirPort Utility, but this is simply a conversion from the ASCII passcode: you cannot tell AirPort Utility to use hex passcodes on the base station. Older versions of OS X allowed you to do this and use lower encryption (i.e. 40-bit, 5-digit passcodes). So the problem seems to be the synching of the passcodes: I need to use an ASCII passcode on the PowerBook so it can talk to the base station properly, but the Orinoco software seems to want a hex passcode, without the option of using an ASCII passcode. Now, this could be wrong. Just a hypothesis. Perhaps I should add a "$" to the front of the passcode, or a "0x"? Any suggestions for the old 5300ce over a 128-bit WEP encrypted network? You've got me on this one. Geek that I am, I can't quite wrap my head around all of this encryption stuff - why can't it use an ID and password login like a server? - so I just run my WiFi naked. I'll post this in the mailbag. Maybe someone has the answer you're seeking. In response to Dwain Elliott's article, I have a Fujitsu Lifebook B2620, which does not have an internal optical drive, and I really haven't had any difficulties, except loading Windows. Not having an internal optical drive makes it possible for the computer to be light. In your latest LEM Mailbag, Scott Cook commented, 'Apple should eliminate the optical drive(s) in all their computers or come up with some way to eject a disc that failed to mount.' When a disc fails to mount on my Mac, Disk Utility allows me to eject or mount it directly from the application. No need to restart. Thanks for writing. I've passed your suggestion along to Scott Cook. "I have a feeling the Microsoft does nothing to optimize performance on Macs." They absolutely do. The Mac group is 100% separate from the rest of Microsoft. They do all their programming completely separately from the Windows Office group. Microsoft Office:Mac is as different from "2007 Office System" for Windows as it is from OpenOffice. The only link is file format (and the fact that it took a year to come out with a converter shows that the Mac group isn't treated very well even within Microsoft) and the name "Microsoft". Microsoft makes a decent chunk of change off the Mac; it's not like it's a loss-leader or anything. (Heck, they don't sell an OEM copy, so basically every copy sold is at full price.) If Office:Mac were to start losing money, you can bet Microsoft would discontinue it and start telling people to run Windows Office in Boot Camp or Parallels. But I would wager that most copies of Windows and Office that would be installed in Boot Camp or Parallels would be cheaper OEM copies, and so the total profit would probably be less than the single copy of Office:Mac. As for the speed difference of an Intel Mac vs. a PowerPC, I went from a G4 1.25 GHz to a Core Duo 2.0 GHz, and DVD encoding time dropped to less than 1/3. If I run third-party video encoding software, my Core Duo gets done in about 25% the time of the G4. Even if I force the encoding software to run in PPC-mode ("Open Using Rosetta"), the Core Duo still gets done faster. Thanks for writing and sharing your experience working with video on Intel Macs. I stand by my comments: Microsoft Word 2004 is slow and bloated. It takes a long time to load and a long time to do many tasks - this is in comparison to AppleWorks 6.2.4, which I've been using for years and which feels instantaneous by comparison. I can't compare it to Word for Windows, but it absolutely annoys me how l-o-n-g it takes to double-click a link in a Word document and eventually have the page open up in Safari.